As promised here, I'm sharing more from the exhibition Impressionism, Fashion, and Modernity, on display at the Metropolitan Museum of Art through May 27, 2013 and then at the Art Institute of Chicago, June 27-September 22, 2013. The focus of the exhibition is the relationship between women's fashion 1860-1880 and the Impressionist painters working during the same time. 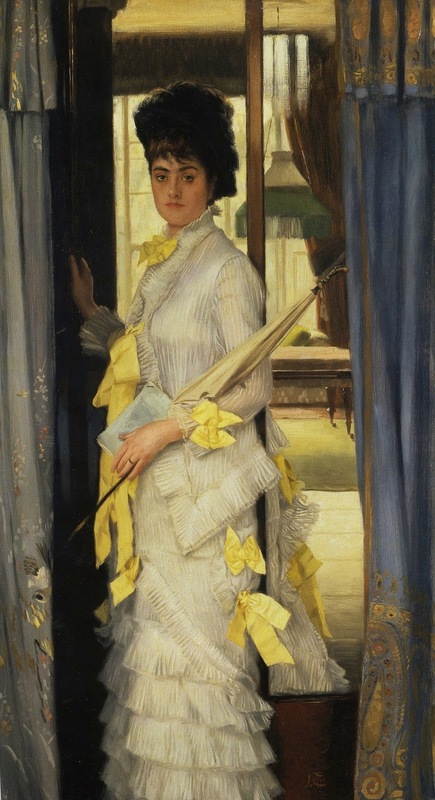 James Tissot (1836-1902) enjoyed painting beautiful women, and lavished much care on the details of their clothing. (I've shared another of his paintings here.) White cotton batiste dresses were popular for summer day-wear in the late 1870s, the feminine light fabric showing off the endless ruffles, tucks, and gathers that embellished the bustled gowns. In these two paintings, hung side by side in the exhibition, Tissot painted the same dress to very different effect. In Portrait, left, the young lady (her identity is now unknown) is wearing the dress as it was designed, over a long, stiff corset, multiple petticoats, and a bustle - the height of fashion in 1874. It's the undergarments that give both the dress and the lady the stylish, vertical shape. Tissot emphasises the crispness of the fabric, with every pleat sharply ironed and briskly delineated. Even the bright yellow silk bows seem animated, like butterflies that have lighted for a fleeting moment on the white cotton. But when the dress reappears four years later in July: Specimen of a Portrait, right, the mood and the dress are altogether different. Dated from 1878, this picture is a portrait of Tissot's long-time mistress Kathleen Newton, comfortably seated on a couch before the open window of a seaside house. Her languid pose captures the heat of the summer afternoon, with her hair pinned up in a casual, slightly frizzy topknot. The white dress, too, is at ease. Gone are the restrictive corset and layered petticoats. Now the cotton softly drapes over Kathleen's natural body and crossed legs, and the translucent sleeves seem to cling damply to her arms. Even the yellow ribbons have relaxed, the silk no longer crisp, but faded and limp. The notes from the Museum's curator suggest that the second painting reflects a change in fashion during the intervening years, a shift from a fuller silhouette to a narrower one. 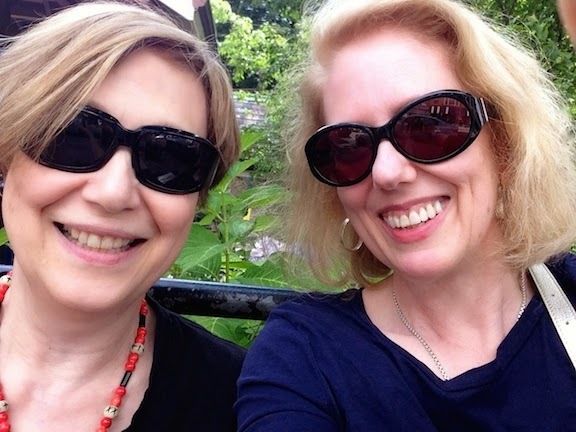 To me, it looks like a more personal transition, a crisp, new dress first worn formally, that over time becomes relegated to the status of a comfortable old favorite. There is, of course, no "right" answer here, since neither Kathleen Newton nor James Tissot are here to ask. What do you think? Above: Portrait, by James Tissot, c. 1874. Tate. Below: July: Specimen of a Portrait, by James Tissot, c. 1878. The Cleveland Museum of Art. Interesting observation! I love Tissot. Have a look, it's lovely! Anne Elizabeth, that IS a spectacular reproduction! 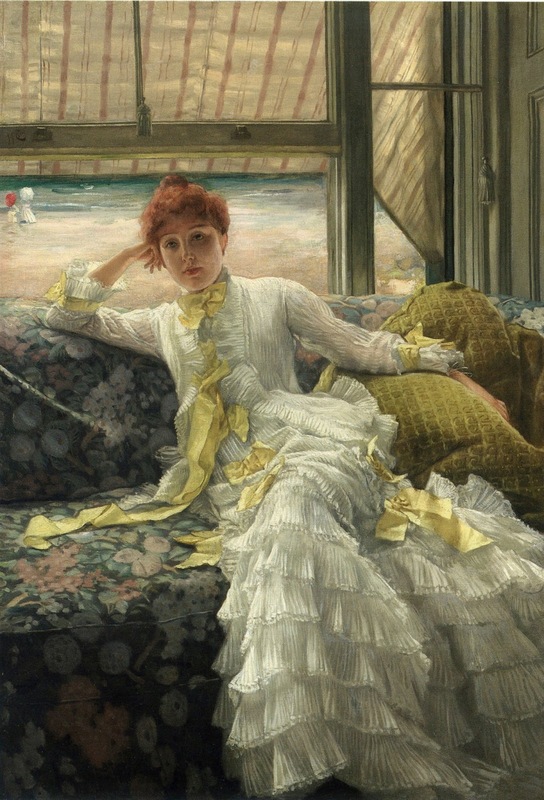 Also interesting to see how many more times Tissot used this same dress in his paintings, and always to a different effect. The Met show had a similar 1870s white bastiste dress in a display case nearby, but alas, they were being quite strict about picture-taking, so as much as I'd wish I could have added it to this post, I couldn't. But the photos of the reproduction do show how light and feminine this look could be. Thanks for sharing! Tosspot has always been one of my favorite artists, and I love how he often used a dress several times. Thi one, obviously, is one of my favorites... Though I'm still on a quest to find affordable black and white striped silk taffeta to make another dress that made numerous appearances in his paintings. Those bows and ribbons certainly were at attention. The second reminds me of how several years later we might rush home today to get into a comfy,relaxed, used pair of pants. Maybe she was sitting there dreaming and fantasizing about cool breezes or even air conditioning in that high collared dress. I would title this Impressionism, Fashion and the move towards Modernity. Although the paintings were only a few years apart, the different views reflected a move towards a New Woman - less back pain, fewer broken ribs, better breathing, no need for a man to guide her rigid body when walking in public... Even the future possibility of playing tennis or riding a bike.